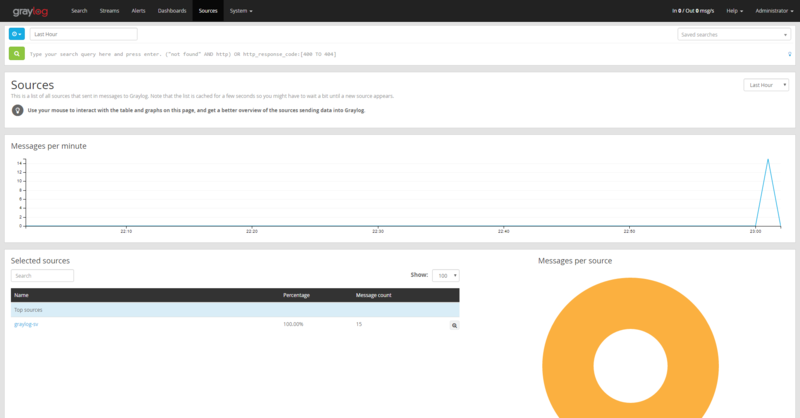 Graylog is a powerful open-source log management platform. It aggregates and extracts important data from server logs, which are often sent using the Syslog protocol. It also allows you to search and visualize the logs in a web interface. In this tutorial, you'll install and configure Graylog on Ubuntu 16.04, and set up a simple input that receives system logs. Oracle JDK 8 installed, which you can do by following the "Installing the Oracle JDK" section of this Java installation article. Elasticsearch 2.x, which you can install by following Steps 1 and 2 of the Elasticsearch installation tutorial. Certain versions of Graylog only work with certain versions of Elasticearch. For example, Graylog 2.x does not work with Elasticsearch 5.x. Refer to this Greylog-Elasticsearch version comparison table for the exact version. This tutorial uses Elasticsearch 2.4.4 and Graylog 2.2. MongoDB, which can be installed by following the MongoDB tutorial. We need to modify the Elasticsearch configuration file so that the cluster name matches the one set in the Graylog configuration file. To keep things simple, we'll set the Elasticsearch cluster name to the default Graylog name of graylog. You may set it to whatever you wish, but make sure you update the Graylog configuration file to reflect that change. Since we modified the configuration file, we have to restart the service for the changes to take effect. Now that you have configured Elasticsearch, let's move on to installing Graylog. In this step, we we'll install the Graylog server. First, download the package file containing the Graylog repository configuration. Visit the Graylog download page to find the current version number. We'll use version 2.2 for this tutorial. Next, install the repository configuration from the .deb package file, again replacing 2.2 with the version you downloaded. Graylog is now successfully installed, but it's not started yet. We have to configure it before it will start. Now that we have Elasticsearch configured and Graylog installed, we need to change a few settings in the default Graylog configuration file before we can use it. Graylog's configuration file is located at /etc/graylog/server/server.conf by default. First, we need to set the password_secret value. Graylog uses this value to secure the stored user passwords. We will use a randomly-generated 128-character value. For more information on using sed, see this DigitalOcean sed tutorial. Next, we need to set the root_password_sha2 value. This is an SHA-256 hash of your desired password. Once again, we'll use the sed command to modify the Graylog configuration file so we don't have to manually generate the SHA-256 hash using shasum and paste it into the configuration file. Note: There is a leading space in the command, which prevents your password from being stored as plain text in your Bash history. Find and change the following lines, uncommenting them and replacing graylog_public_ip with the public IP of your server. This can be an IP address or a fully-qualified domain name. Since we changed the configuration file, we have to restart (or start) the graylog-server service. The restart command will start the server even if it is currently stopped. Next, check the status of the server. You should see active for the status. If the output reports that the system isn't running, check /var/log/syslog for any errors. Make sure you installed Java when you installed Elasticsearch, and that you changed all of the values in Step 3. Then attept to restart the Graylog service again. 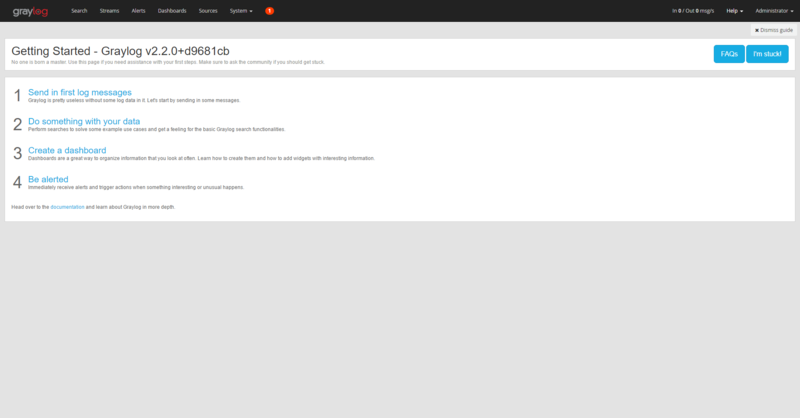 Once Graylog is running, you should be able to access http://your_server_ip:9000 with your web browser. You may have to wait up to five minutes after restarting graylog-server before the web interface starts. Additionally, ensure that MongoDB is running. Now that Graylog is running properly, we can move on to processing logs. Let's add a new input to Graylog to receive logs. Inputs tell Graylog which port to listen on and which protocol to use when receiving logs. We 'll add a Syslog UDP input, which is a commonly used logging protocol. When you visit http://your_server_ip:9000 in your browser, you'll see a login page. Use admin for your username, and use the password you entered in Step 3 for your password. To view the inputs page, click the System dropdown in the navigation bar and select Inputs. You'll then see a dropdown box that contains the text Select Input. Select Syslog UDP from this dropdown, and then click on the Launch new input button. For Node, select your server. It should be the only item in the list. For Title, enter a suitable title, such as Linux Server Logs. For Bind address, use your server's private IP. If you also want to be able to collect logs from external servers (not recommended, as Syslog does not support authentication), you can set it to 0.0.0.0 (all interfaces). For Port, enter 8514. Note that we are using port 8514 for this tutorial because ports 0 through 1024 can be only used by the root user. You can use any port number above 1024 should be fine as long as it doesn't conflict with any other services. Now that an input has been created, we can send some logs to Graylog. We have an input configured and listening on port 8514, but we are not sending any data to the input yet, so we won't see any results. rsyslog is a software utility used to forward logs and is pre-installed on Ubuntu, so we'll configure that to send logs to Graylog. In this tutorial, we'll configure the Ubuntu server running Graylog to send its system logs to the input we just created, but you can follow these steps on any other servers you may have. If you want to send data to Graylog from other servers, you need to add a firewall exception for UDP port 8514. Create and open a new rsyslog configuration file in your editor. Add the following line to the file, replacing your_server_private_ip with your Graylog server's private IP. Save and exit your editor. Restart the rsyslog service so the changes take effect. Repeat these steps for each server you want to send logs from. You can also click the Search tab in the navigation bar to view a overview of the most recent logs. You can learn more about searches in the Graylog searching documentation. You now have a working Graylog server with an input source that can collect logs from other servers. Next, you might want to look into setting up dashboards, alerts, and streams. Dashboards provide a quick overview of your logs. Streams categorize messages, which you can monitor with alerts. To learn more about configuring the more advanced features of Graylog, you can find instructions in the Graylog documentation.